Value of card: "At least we had values back then, sonny." 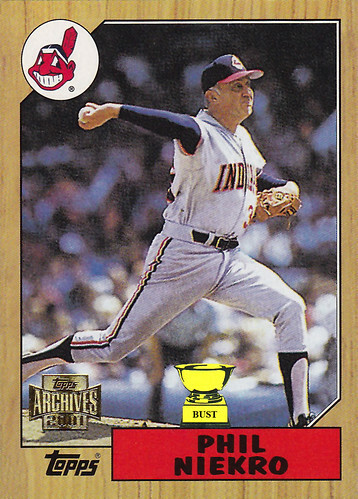 We could go on all day: How old was Phil Niekro in this card? Phil Niekro was so old, he napped through the seventh-inning stretch. He was so old, he didn't know there was a New Mexico. He was so old, this was the lowest his belt got all season. He was so old that when he first came up to the bigs, the American League was called the British Colony League. He was so old, if his big-league career was a person, it'd legally be able to drink. He was so old, he called the bullpen car a "horseless carriage." In fact, Phil Niekro was so old, he didn't need a rosin bag — he needed a colostomy bag.